Mattel's live-action superhero toys are garbage. Reincarnated Egyptian prince with powers of strength and flight. Hawkman comes to us from Legends of Tomorrow, the show which does a better job of mining its parent company's huge library of nobodies than Agents of SHIELD does, but still manages to feature the dumbest people imaginable making the worst decisions of all time. Seriously, the team can do nothing right. Had to abandon half your roster in the past when you made a quick escape? Better leave them there for years rather than using your amazing time machine to go pick them up right away! Come on, even Doc Brown could manage to get that one right, and he's been legally commited to a psych ward in the past! The characters are great, but every one of their plans is a profound failure. 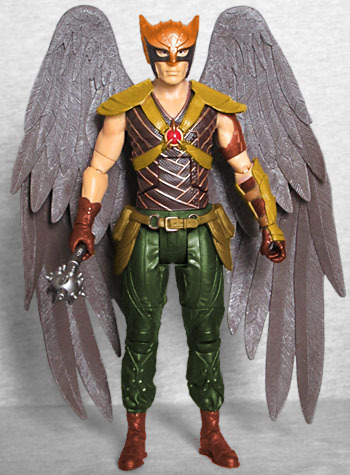 You may recall that Hawkman, in the comics, is one of the most colorful characters around, what with his red boots and trunks, his green leggings, his yellow harness, and his orange mask. Legends of Tomorrow makes him browner than a modern videogame. Brown boots, two-tone brown pants, brown belt, brown shirt, brown harness, brown gloves, brown armor. Thanks, TV! You've really done yourself proud! He doesn't need to be a direct copy of the comics (that didn't work so great on Smallville, after all, and the pattern is great), but for Hawkgod's sake, give us some color! Carter's armor is asymmetrical, leaving the right arm bare above the glove, while only exposing his left elbow and armpit to the open air. His shirt is made of overlapping bands, which does call to mind his Egyptian origins. But speaking of Egyptian, why is a reincarnated Egyptian prince played by a German actor? Yes, nobody knows what ancient Egyptians actually looked like, but it probably wasn't "lilly white." Surely there had to be some Middle Eastern actors who would have been thrilled to not have to play a terrorist on 24 for a change. Not that it matters for this toy - it's got a Gentle Giant scan, which means the detail is soft overall, and Carter's molded with his "Mexican carnival prize" Wolverine mask, rather than it being a separate, removable piece. The articulation is total crap. Mattel's toys are bad to begin with, but this takes things to an all new level of mediocrity. His tiny, undersized feet have hinged ankles, there are hinges in the knees, swivel thighs, H-hips partially blocked by his hip armor, a swivel waist, hinged torso, swivel wrists, hinges in the elbows that only move about 10°, swivel thighs, swivel/hinge shoulders, and a balljointed head that can't move up or down at all. Top-notch product, Mattel; top-notch product. 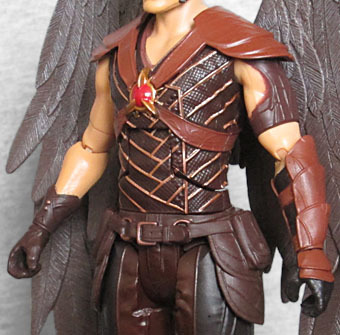 The wings are the same ones DCUC Hawkman had, with the giant ugly hinge in the back. Those weren't terrific in 2009, and they're worse now (especially since we've seen the Four Horsemen create better ones themselves). 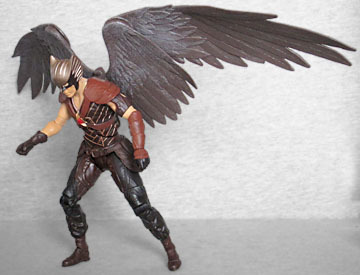 Hawkman has only one accessory, his Nth Metal mace. It's patterned just like the one in the show, but it's molded from a plastic so soft that it bends under the force of gravity. It's not painted at all, and is really just a massive waste. Better to come with that than nothing though, right? He does come with the left leg of King Shark, the first Build-A-Figure Mattel's made in years that's actually worth building. 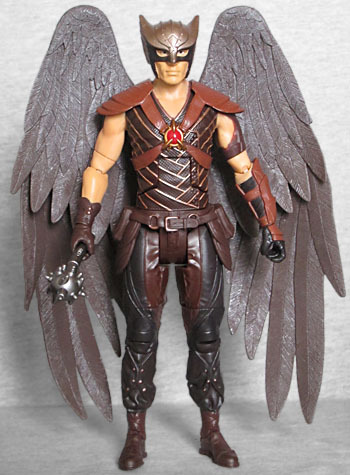 It's just a shame that you have to buy Hawkman to get it. If nothing else, at least we can tell the final figure will be huge! When Hasbro does figures from Marvel's movies and TV shows, they're the same scale and level of detail as the normal Marvel Legends; when Mattel makes DC movie or TV toys, they're undersized, under-detailed, and under-articulated. They made a mistake in 2008 with their first Movie Masters and have been doubling down on it ever since. If at least the size were right, we could trepedaciously recommend this one, but as it is? There's a reason this is the slowest seller in the series.